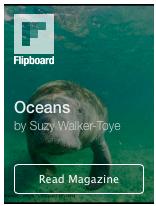 This weeks theme is darkness, which technically you cannot photograph or you’d just have a black image but there are plenty of opportunities to photograph in dark places under the water. 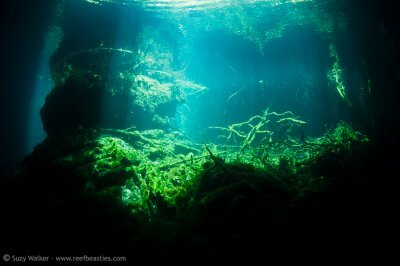 These photos were taken in the Cenotes in Mexico but similar effects of light shafts can been seen in caves all over the world where the sunlight can stream in. Also, the insides of wrecks can be artificially lit to illuminate the darkness. Obviously at night, the whole sea goes black and artificial light is all you have. For this type of underwater photography, you have to have great knowledge of your camera (because the light, if you have a torch with you, is usually facing towards the subject and not your camera or strobe controls). And of course the discipline to check on your diving equipment every now and then. Lucky, I learnt early on that deep inside a cave you can accidentally go too deep to get the right angle, spend too long and end up with unwanted deco time and very little air! Safety first people. 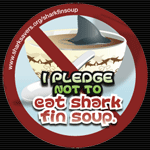 It’s not for everyone though, my husband hates diving in the dark (night dives, inside of wrecks etc). 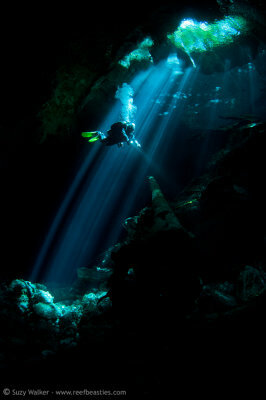 He came into the Cenotes because you can mostly always see the light from somewhere but he wasn’t very happy at all. If you’ve dived with us you’ll often see him hanging around outside of wrecks looking frustrated that I’m taking ages no doubt. 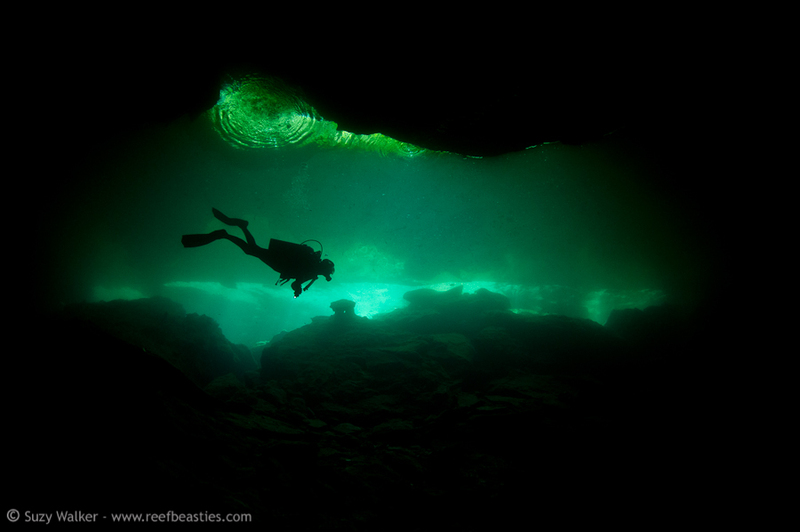 Tell me in the comments what is your favourite dark place to scuba diving? To see all the other photo Friday entries (and submit your own) for ‘Darkness’ here. People think its the shafts of light but the thing that makes caves & caverns atmospheric is the shadows. 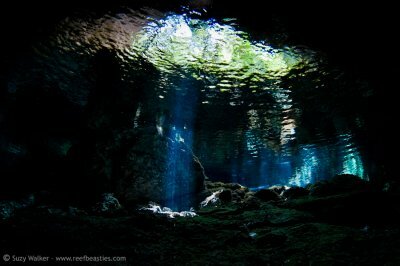 Here’s one from Chac Mool Cenote in Mexico. To see all the other photo Friday entries (and submit your own) for ‘Shadows’ here. Psst… Please check out my excellent used Nikon Gear page, I’ve swapped over systems and I’m trying to raise money on my previous gear. This weeks theme got me thinking about what creates a feeling of space in am image? 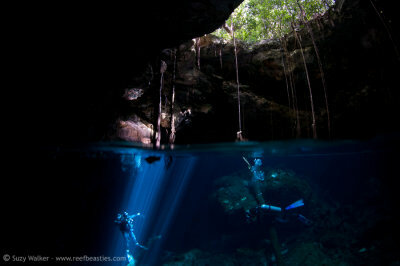 Take these two images of the same Cenote in Mexico for example. Shot at the same time of day with the same gear. 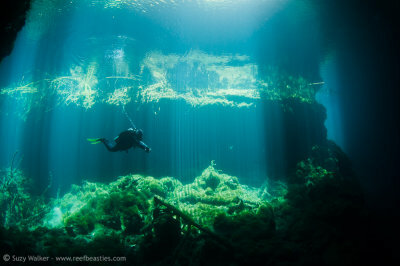 The divers are roughly the same size in the image yet its the landscape orientation photo that feels more spacious to me. Please let me know what you think in the comments below? 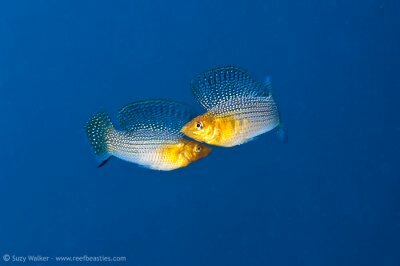 If you want to see my underwater photos from various places then check out the collection of galleries in my Reef Beasties Gallery. Or my best from 2012 here. To see all the other photo Friday entries (and submit your own) for ‘Spacious’ here. PS: I’m currently still selling my 60mm/D300 underwater macro set-up. Click here for more details & the full list of equipment for sale or email me at scubasuzy-sellingnikongear@yahoo.co.uk. Thanks for supporting my work! 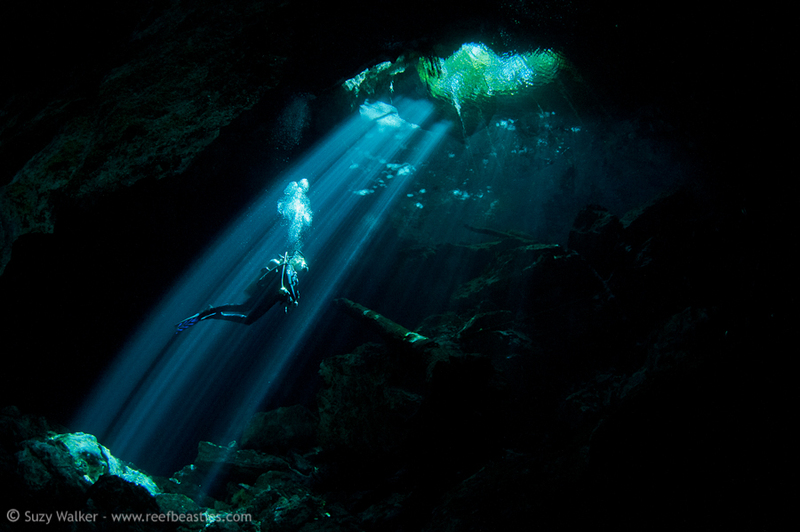 Quite often I go underwater and turn off my strobes and just shoot with the natural light. The most spectacular and dramatic lighting comes in from shafts of sun shining in at the tops of caves or through the beams of jettys. The photo above was taken in a Mexican Cenote (a giant cavern filled with fresh water). So next time you find yourself in a dark place, try turning off the lights and see what natural light there is. 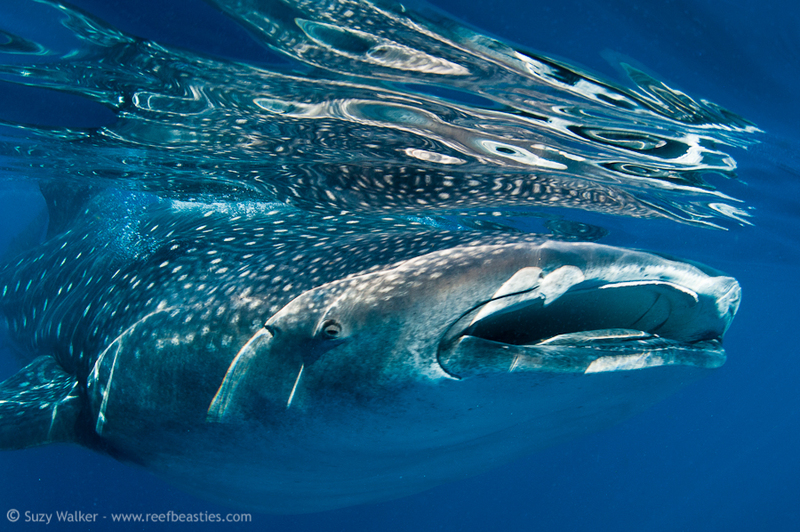 You can see more whaleshark and cenote photos here. 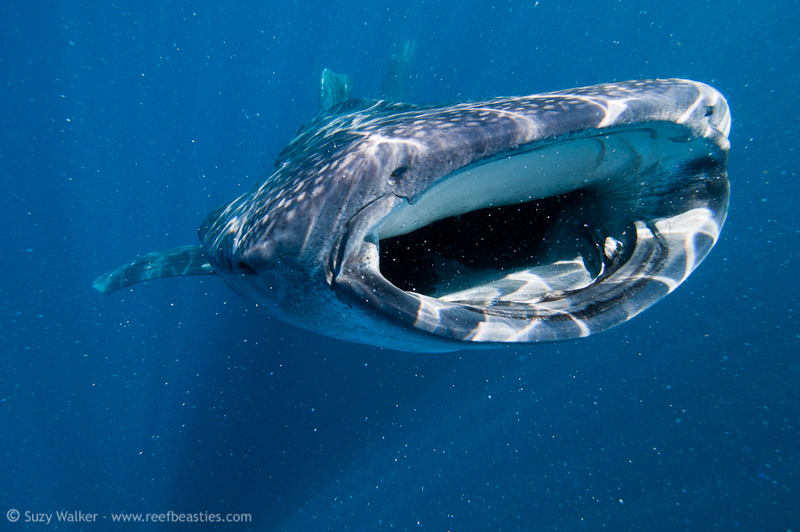 If you want to see my underwater photos from various places then check out the galleries in my Reef Beasties Gallery. Or my best from 2012 here. See all the other photo Friday entries (and submit your own) for ‘Natural Light’ here. PS: I’m currently selling the camera that took these photos. Click here for more details & the full list of equipment for sale or email me at scubasuzy-sellingnikongear@yahoo.co.uk. 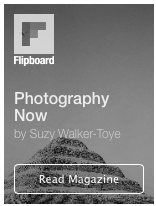 Thanks for supporting my work! As a follow on from Chac Mool & Taj Mahal, I know I promised you even more Cenotes from mexico and I got a bit side tracked with other things but I didnt forget. Here is my post about the aptly named “Eden”. From the surface Eden is like a huge swimming pool – very open. In fact some of the kids were jumping off the platform into the water below and some were trying to balance on the rope strung across the middle. In fact it seemed as though it was a busy swimming area for the local families. 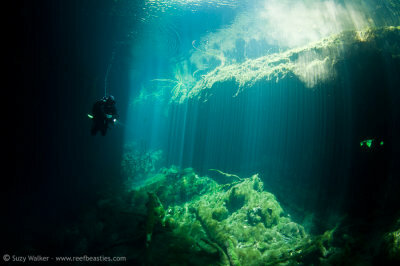 In fact they gave us strange looks as we donned all our gear and slipped beneath the water. Once you’d passed all the commotion (being careful that no one landed on your head of course) you could enter a long dark tunnel. Out the other side was calm, empty and very beautiful. In fact Eden has a little bit of everything. 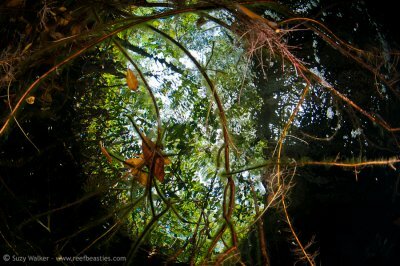 The muck-about swimming area, the cavey tunnel with small stalactites ,the striking sunbeams and a lovely little mangrove area full of tree roots and small fish. 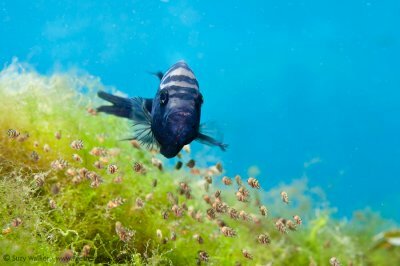 This little Cichlid Fish protects his babies by trying to hide them in the moss. but they called it a draw and no one got hurt or eaten. I do hope you’ve enjoyed my little slice of Eden. 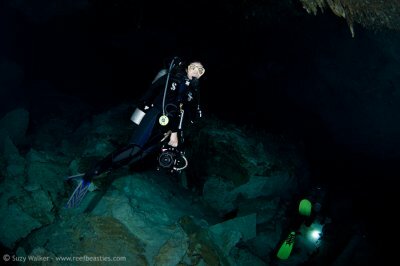 Continuing on from yesterdays mexican cenote post here are the photos from Taj Mahal Cenote. The stalactites (above) were less impressive than those at Chac Mool but the haloclines (where the salt water creates blurry layers of water) were still amazingly cool. You can see the layer more clearly in this photo but it doesnt do it justice. 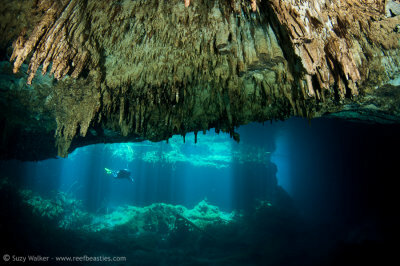 Since its so dark in the caves you really need an underwater tripod like this one here that Alex is setting up and also preferably a camera that goes to high iso with little noise. This was the entrance & exit to the cenote… most of them have some form of stairway or natural rocky steps to help you in and out. 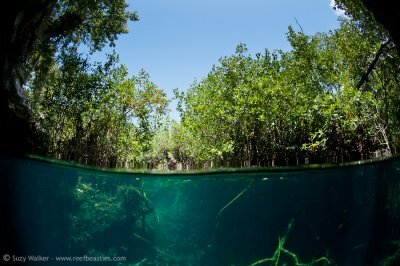 I hope you’ve enjoyed my photos from the Taj Mahal Cenote, next up Eden…. What a perfect theme to resume my posting to! I’ve been very quiet on the blog of late in part because of the lack of interesting (to me) themes from photofriday.com but also because I’ve been away in Mexico. 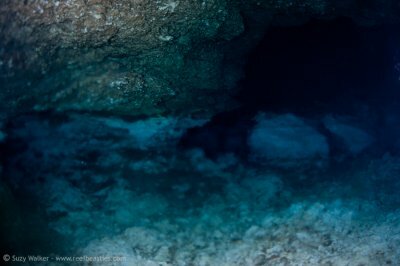 I’ve got lots of interesting photos to share with you all but for now here’s a couple from the Cenotes in Mexico. I’ll put some more posts up about them with more details soon. 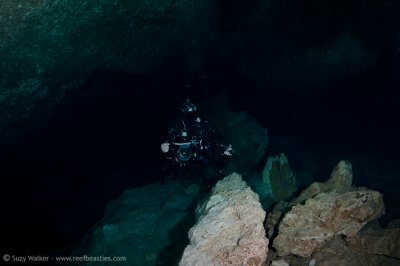 I’ve not done much fresh water diving and hardly any diving in caves and one of the things that struck me was the quietness. You’d expect underwater that the sound would be off anyway but not so, the reef is full of sounds. The caves were very quiet, cold and dark. And of course stunningly beautiful. If you want to see more of my underwater photos from various places then check out the galleries in my Reef Beasties Gallery. See all the other photo Friday entries (and submit your own) for ‘Quiet’ here.